Today the European Commission published a 23 Step ‘Fintech Action Plan’ to help promote more competitive and innovative financial services across the European Union. 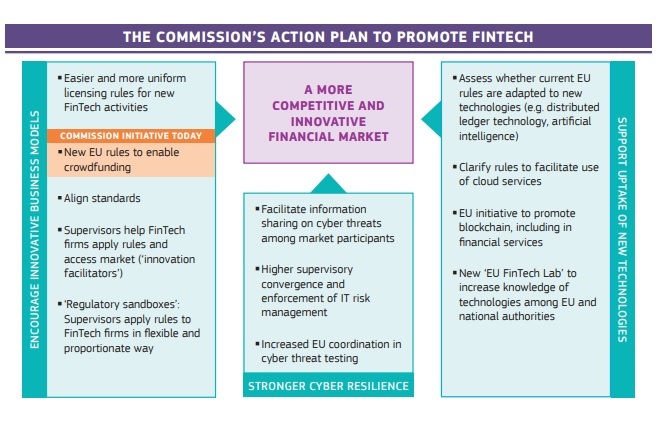 The Fintech Action Plan press release gives you a quick flavour of the high level plan with the usual focus on blockchain, distributed ledger technologies, digitisation, cybersecurity and crowdfunding with a view to promoting connectivity and collaboration across the EU. The European Commission (EC), the executive arm of the European Union, has unveiled a new FinTech action plan designed to help harness the opportunities made available by new technologies like blockchain. In a document titled “FinTech Action plan: For a more competitive and innovative European financial sector,” the EC said that it is planning to form a new FinTech Lab in the second quarter of 2018. The FinTech Lab will allow European and national authorities to engage with tech firms in a “neutral, non-commercial space. ” “The Commission will establish an EU FinTech Lab to raise the level of regulatory and supervisory capacity and knowledge about new technologies,” the EC said.